After a long stressful week, nothing compares with the relief brought by an escape back to mama nature’s arms. Escaping from the city has this “healing” factor. It naturally de-stresses you physically and mentally. Everybody has their own share of getting stressed, be it from work, school, relationships or simply “kaartehan”. This past weeks, I had my share of being stressed mentally. I had nothing in my mind during those weeks but the arrival of weekends. Luckily, NCR Trekkers Club once again held their monthly climb for November last weekend. The club chose Mt. Naupa as the spot to be. It was an overnight weekend activity, perfect for my schedule. Again, your resident adventure freak came in as a joiner as usual. Thanks to some of my friends from the club, including Sir Wandering Soul Scamper and Four Eyed Laagan, who once again invited me for this trip. The climb was not really exclusive for the club members, it was open for all joiners. Actually there were more joiners than the actual club members during the climb. Overall there were almost 40 participants. Mt. Naupa is located in Naga City, just an hour away from Cebu City. Trekking activities on the mountain has started to increase in number. Not only because it features great landscape views, but also, due to its accessibility and the trails are already well established. Climbing the mountain requires no much effort, even first timers can do it in less than an hour. Rain or shine is not an issue. Night trek is also possible and poses no problem. For me, this is one of the easiest mountains that I climbed by far. 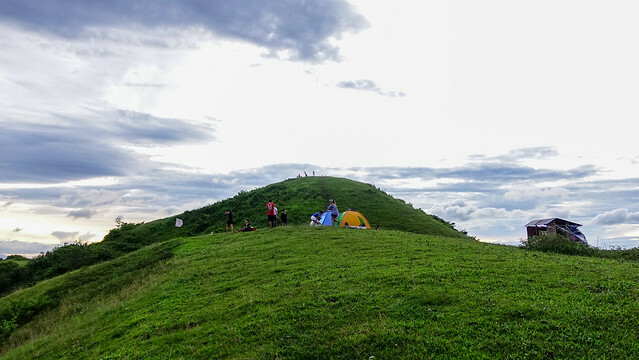 At the top, is a wide grass space for camping. I do not suggest camping at one of the summits due to strong cold winds by night, and also not to deprive other visitors of the great and picturesque view at and from the top. 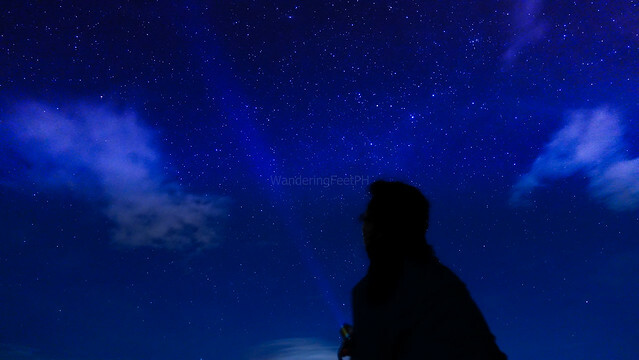 During our climb, the group was divided into afternoon and night trekkers. Out of all participants only 9 went on the afternoon to chase the sunset, and the rest were night trekkers. From the 9 afternoon trekkers, only the 4 remained since the other 5 were just day trekkers and went home hours after arriving at the top. Unfortunately, timing was not on our side, the skies were cloudy, and it was already a bit late thus we were not able to capture the sunset. Regardless, the view was still stunning. The group then pitched the tents upon arriving at the camp. As for me, I did not miss the opportunity to grab at least one good late afternoon photo. I assaulted straight at the summit to capture several afternoon photos before getting back to the camping area to pitch my tent. It was already dark when I pitched my tent. It was a bit of a challenge especially when you got no 20/20 vision, like me. After we pitched our tents, all we have to do is to wait for the other groups. There were 2 night-trekker groups that arrived earlier. Unfortunately, the other night-trekker groups communicated with us and gave us an estimation that they’ll be arriving at the camp by 10PM. So we then decided to prepare our dinner. After we had our dinner, we decided to assault at the summit to have our night photo-op. We left our things at the camping site including our meals for the next day. Alas! We made a mistake! The mountain dogs ambushed our meals. Tent vestibules are not safe to put your foods especially if there are cats or dogs around. Unattended foods must be kept inside the tents. Good thing we still have the canned meats for the next day. It was already late, around 11PM, when we decided to go back to the camping site. It was a perfect timing since the other groups already arrived and have already settled and pitched their tents. Good thing they already took their dinner before their trek, so that we can already start the socials section. 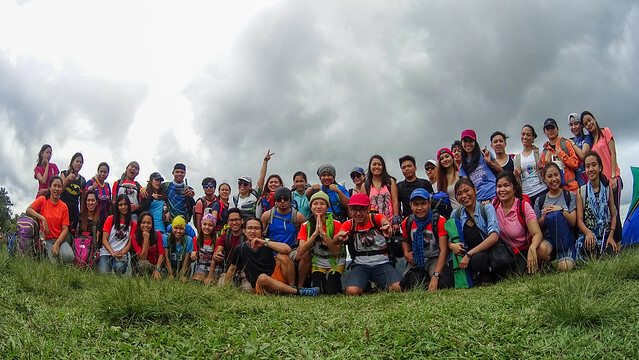 During our socials, there were few familiar NCR trekkers faces and a lot of new joiner ones. As usual, there will be self introductions and asking. I could not memorize the names of everybody except for those already familiar ones and the those I already know. The night continued with us playing the classic and almost everybody’s favorite, the werewolf game. The game is best played with a large group of people. It generally is a game of deception and connivance. Good grief! The skies did not allow us to continue. It drizzled for a moment, thus halted our game. It was already late when the skies cleared up. Some of groups already went to sleep, others also had their little group talk. Meanwhile our group continued talking and laughing with rum as our mediator. We continued talking until unknowingly it is already around 5AM. We stopped to get at least an hour of sleep. Everybody was up by around 7:30AM. The sound of the people talking, laughing and preparing their meals triggered me to get up. I don’t know why even with just few hours of sleep I did not feel tired and groggy. As the other groups prepared their meals, we also started cooking ours. We just settled with the canned meat left and few grains of uncooked rice. Luckily though, some groups got more than enough food and kind enough to share it with us. There were so much food that we ended up giving some to the dogs and the locals. By around 9AM, we broke our camp and prepared ourselves. Of course one last photo-op cannot be missed. Another round of picture-taking at the summit and last group shots at the camping site. The descend was easy and smooth. Thankfully there were no slips and injuries. Back at the chapel, the trail’s entry point, were motorbikes waiting to take us back to the main road. We rested for a while before hopping on to the motorbikes. We reached the main road before noon and took another jeepney ride back to Cebu City where we disbanded. It was another great experience for me. It was my first time trekking Mt. Naupa and 3rd time as an NCR Trekkers Club joiner. Seeing new and familiar faces again. But most of all, I was rejuvenated and de-stressed. Hopefully I can do this more often not just to escape from stress but also to add onto my experiences and to the stories that I will be telling to my future grand children. From the Cebu City, get yourself to Brgy. Tungkop, Minglanilla. You can ride a jeepney from Shopwise Supermarket for 14 pesos. Or you can ride buses from Cebu South Bus Terminal that would pass through Minglanilla. Ride a motorbike to Naga’s Brgy. Cogon Sto Niño Chapel, where you start the trek. The chapel is already known by the locals due to increasing trekking activities in Mt. Naupa. Motorbike rate is 50 pesos per head, a total of 100 pesos per motorbike. Starting from the chapel, the trail leading to the peak is already established. There are also children willing to guide you to the peak for a price. I suggest, you don’t get one unless you trek by night and not yet familiar with the trail. Sayanga sa pagkaon bitaw. hahaha naka-scavenge unta mi ato. wahaha. till next time! lagi.. hindi kami na orient eh! Gikawat sad sa iro akong food. Hahaha. Di man gud. Sayo man gud ta natug atong OPeak kay nahutdan ug topic. Cool trekking episode! You should also try Mt. KM 28 in Camp 8, Toledo. Very scenic hike. The trek goes through a lot of varied scenery and terrain. Anyway, will try that soon. 👍🏻. Thanks. Wala pa ko kahuman ug basa pero ka`commenton na jd kaayo ko. Nindot kaau tan-awn ang stars!!! Huhuh suya much.